The TRON: UPRISING animated series will soon be coming to end -- with the three remaining episodes airing this month on Disney's X D channel on Sundays at midnight, Pacific time. This brings the series to a total 18 episode run -- or 19 episodes, if you count the 32 minute prologue "Beck's Beginning". Ultimately, the series was never given a fair shake with its sporadic showings and extreme time changes on Disney's X D Channel -- which made it incredibly difficult to follow. While this is "The End" for now -- there is perhaps a possibility of TRON returning in animated series form circa the time of TRON 3. I truly hope that the talented, creative forces behind TRON: UPRISING have the opportunity to gather again as a team in the future to explore this sci-fi/fantasy world further -- so as to continue to push the envelope as they so imaginatively have done. They created something very unique here, and made a bitchin' canon entry for the TRON saga with UPRISING -- one that holds up neck and neck with the two feature films. Is TRON gone? Never… TRON LIVES! * Note: As of this writing, the TRON: UPRISING soundtrack is #7 in the Top Ten Soundtracks on iTunes -- and TRON: UPRISING made the iTunes Best of 2012 list for Breakthrough Animated Series. You can watch the TRON: UPRISING animated series via iTunes, Xbox Live Marketplace, the Playstation Store, and Amazon.com Instant Video -- each venue offers full Hi-Definition and Standard Definition viewing options. Excellent montage: the official music video for the 3OH!3 and JT remix of "Lightbike Battle" -- from the newly released TRON: UPRISING soundtrack. This is disappointing news, to say the least. I wish they could have continued the series, but I will enjoy the remaining episodes and hope for a Blu-ray release. 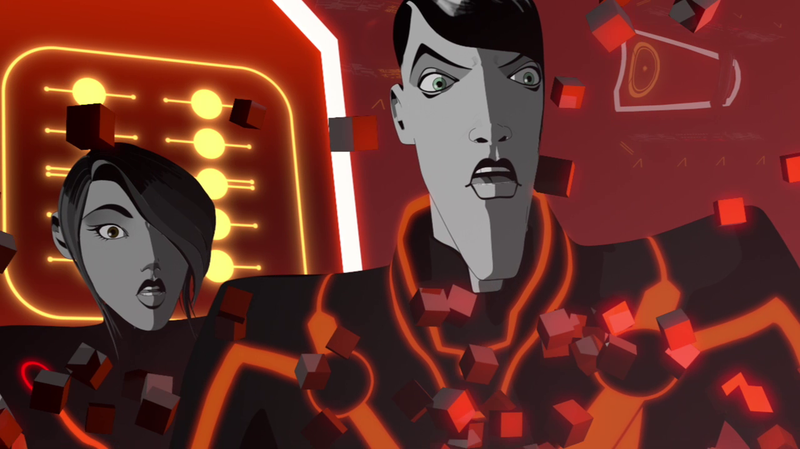 I think one of the main reasons TRON: Uprising was canceled was because of the dark and serious nature of the series. You have to remember, Disney's core audience is children, which is what the Disney Channel focuses it's programming on. In an effort to expand their audience base, they try to target the tween age (and predominantly male) audience with Disney X D's programming. However, TRON: Uprising has a more mature tone to it and addresses some weighty and serious themes in the story arc and character development. Because of its mature themes, I think that the decision makers at Disney weren't sure where TRON: Uprising fit in to their programming and demographics, if at all. People are pointing to Cartoon Network and Nickelodeon as examples: Cartoon Network has Adult Swim. Nickelodeon has Nick At Nite. Why can't Disney do the same? I think the problem is that those networks don't necessarily build their programming model around marketing towards a demographic exclusively made up of children, as they have segments that are marketed to adults (quite successfully). To my knowledge, Disney unfortunately has no comparable analogue. So I think the decision makers decided to give TRON: Uprising a chance on Disney X D, to see if it could work within the confines of that market demographic. And I think they came to the conclusion that, although it's a fantastic show with amazing artistry, story line, music, etc.., it ultimately just didn't fit into their programming model due to its more mature themes. In other words, they know it's a great series, they just can't show it. So I think the success of TRON: Uprising was ultimately hampered largely by Disney's exclusive focus on marketing to children and tweens. But that's just the nature of Disney's business. Everything about it is designed for kids. Unfortunately, TRON: Uprising is not. Who knows, maybe in the future, Disney will start another channel targeted toward adults to compete with Cartoon Network and Nickelodeon. Now that they have acquired the Marvel and Star Wars franchises, shows such as The Clone Wars and TRON: Uprising could help Disney compete with it's competitors for market share. I guess only time will tell. And to Charlie Bean and all the TRON: Uprising crew that made this incredible show happen, I'm sure many TRON fans will join me in saying "Thank you" for taking us back to the Grid, if only for a short while. Excellent work, everyone! Well done! This news absolutely broke my heart. My world revolves around everything TRON, and Uprising was just so amazingly written and put together, it was just that much of an amazing addition. They had a petition going, asking Disney to move up the time, but it seems it didn't get enough people. This show will truly be missed in my household. Hope they release it on Blu-Ray! Till then, Ill enjoy the last 3 remaining episodes, and I suppose TRON movie nights and re-reads of the Graphic novel will suffice. Surprised...but not shocked considering everything which has occurred with how Disney has handled the series. It's quite a shame. Not ashamed to admit it's one of my favourite programs (er...the pun wasn't exactly intended) of all time. And to think a majority of series at least has at least 26 episodes a season. Tron Uprising wasn't even graced with this. A few more episodes may have tied some loose ends which may have been left hanging. Hopefully all this won't come to a rush ending of sorts. Although it very well could be the writers could have prepared for the possibility. We all know Tron gets captured at some point and becomes Rinzler. More than likely it was a mistake for Tron to reveal himself to "you know who" to deliver the "you know what" message". It may end up being his downfall. But this is conjecture. What we don't know is if Beck is successful in leaving him and carries on or he's put to a halt due to some bad choices he makes within the final 3 episodes. I'm thinking the final two will have quite an impact. But, that's just me. Grateful there was a soundtrack released for the series. Anxiously waiting for the DVD to come out. Either way in whatever shape or form: TRON LIVES!!! Okay, let me get this straight. We get three more episodes after over a month or so it's been moved to the midnight time slot at Disney and then the show gets the ax? I can understand the US Government mulling our troops out of Afghanistan in the future, but for Disney to pull Tron: Uprising off the air has to be the dumbest thing they've ever done. I can understand Disney bowing down to the 'bean counters' and worshipping numbers but what makes no sense is that if they can't handle the maturity level of TRON UPRISING and the company buys out Lucasfilm's Star Wars property which happens to have similar violent/mature tones to TRON, one has to proclaim WTF is wrong with the picture here. It can't be low ratings as the driving factor because if Disney truly wanted to keep the show alive, they should make it an internet exclusive only rather than expose it to their "kiddie audience" out of fear from parental retribution. They can't open up a new channel devoted to mature shows, so ultimately they will have to create a new avenue online for this reason, unless they want to make a deal with Cartoon Network for a more appropriate audience to showcase it to. And it can't be the expense of the show itself unless somebody up there is'nt doing the accounting properly. I think the answer is that they are. . . . .WUSSES. It takes BALLS to keep that show on to the point of conclusion despite the ratings. I dare anybody from Disney who's reading this to come on board and admit they screwed up and apologize for the sheer near-sightedness of their marketing. Think about it. Disney had the money to buy out Lucasfilm and Marvel Comics but can't handle the losses of Uprising? Something does'nt smell right to me. We can't just sit here and let Disney d--k with us. Also, I'd like to know if the shareholders pressured them to drop the show which may be part of it of the reasons. Millennium was one of my most favorite shows of all time from Chris Carter. After it ended over three seasons, do you know what happened? The fans took it upon themselves to create virtual seasons to continue the Millennium legacy (pun intended, sorta). Even Lance Henriksen and Chris Carter were impressed with the fans doing it including the fact there was a "Bring Back Frank Black" campaign which is still ongoing. The producers and the fans truly gave a s---t about the property. I'll say it again. Disney WUSSED out. And if I was CLU, I would'nt rectify them. I'd send them to the GAMES for such atrocious stupidity. Think about it. Disney had the money to buy out Lucasfilm and Marvel Comics but can't handle the losses of Uprising? Something does'nt smell right to me. We can't just sit here and let Disney mess with us. Also, I'd like to know if the shareholders pressured them to drop the show which may be part of it of the reasons. Millennium was one of my most favorite shows of all time from Chris Carter. After it ended over three seasons, do you know what happened? The fans took it upon themselves to create virtual seasons to continue the Millennium legacy (pun intended, sorta). Even Lance Henriksen and Chris Carter were impressed with the fans doing it including the fact there was a "Bring Back Frank Black" campaign which is still ongoing. The producers and the fans truly gave a crap about the property. Okay, let me get this straight. We get three more episodes after over a month or so it's been moved to the midnight time slot at Disney's other channel and then the show gets the ax? I feel that the quality of Tron Uprising is so good that it probably was an expensive series to produce. But I really feel Disney made most of it's investment in the series PRIOR to Tron Legacy being released. In other words, the money spent to produce the series was probably "green-lighted" prior to the Movie's release. It makes sense, because the series was announced even before the movie came out, with lots of details. I think the movie "ultimately" underperformed what Disney's expectations were. Even at $176m domestically and $228m worldwide, a total gross of $400m was far less than what Disney was hoping for. I think that by the time Disney came to that realization, the money was ALREADY SPENT (allocated) to produce the series. I believe that After 2010, the only money Disney spent "extra" on TRON:UPRISING was determining when to air the series, the commercials, and the promotional spots. Everyone can see that Disney wasn't going to spend a lot after that point, and ONLY RATINGS would justify extra expense on Disney's part. That didn't happen, and we are left at Monday midnight showings of episodes already produced and money already spent well before Dec 2010. I won't let the revolution end before it has a chance to start. While I’m sad to see it go, we’re 15 episodes in with four to go, and aside from admittedly a crapload of world building and awesome concepts, how has the story changed at all? Where’s the uprising? Is Beck stumbling and failing at every thing he does the uprising? Because that’s what the show seems to showcase. Sso02V Wrote:While I’m sad to see it go, we’re 15 episodes in with four to go, and aside from admittedly a crapload of world building and awesome concepts, how has the story changed at all? Where’s the uprising? Is Beck stumbling and failing at every thing he does the uprising? Because that’s what the show seems to showcase. You're actually complaining that they spent a big chunk of the first season developing Beck's character? One of the things I love about the series is that we've gotten to see Beck grow into someone who could lead a successful uprising, rather than him magically turning into a super-competent leader overnight. It's Beck's story, not just the history of the anti-Clu resistance movement. Argent Wrote:You're actually complaining that they spent a big chunk of the first season developing Beck's character? "There is no offical cancellation as far as I've heard. Nor is there an offical greenlight for season two. Limboland." Earlier this week, I spoke with reps at Disney/filmmakers on TRON: UPRISING -- the show is indeed ending, unfortunately.